Been delightfully busy. I suspect I thrive on chaos! It’s most definitely Spring out here and prettiness is popping up everywhere. 18th century Italian silk brocade…silvery blue with peachy pinks and teal…awaiting being made into a few pillows…inspiring a new bedding mix. As much as I love my greys…change is good! They will have a sale the weekend before Mother’s Day…will let you know details later. Carolyn Quartermaine’s lovely eau de nil with gold script…Bella Notte’s “Perfect Peach” here, their gorgeous (but discontinued Deluxe Marie) in “Ginger“…a wonderful old gold. Colors that are silvered and tarnished down a bit from too bright. Bella Notte’s discontinued Deluxe Marie…40% silk 60% cotton…the most gorgeous, soft bedding fabric! People who have this textile know what I’m talking about…and Bella Notte did it in every one of their colors. Sigh. Many detergents contain phosphates that strip the silk of all it’s luster and I suppose it became too difficult for the company to work with. C’est dommage! The Laundress has a delicate wash here for their silk blend fabrics. I would just check the label of any detergent you are considering for “no phosphates”. 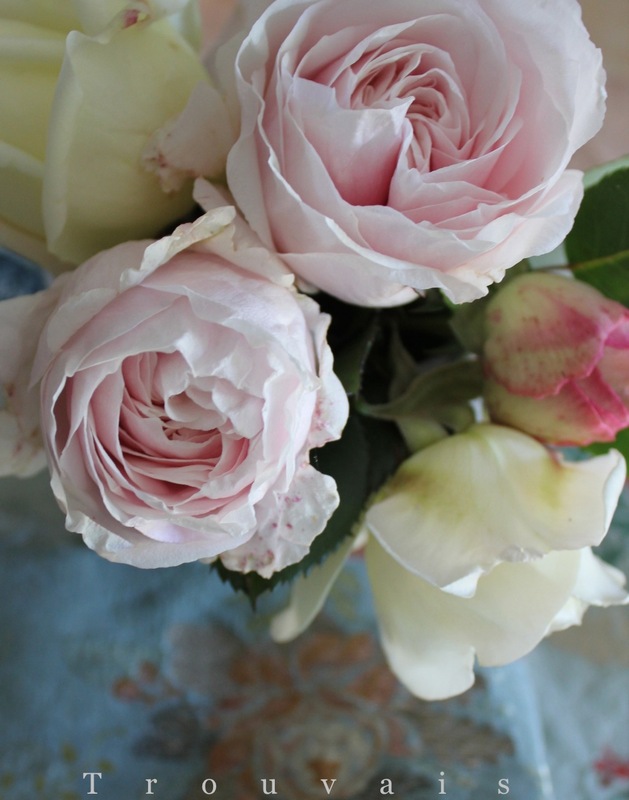 Above “Souvenir de Malmaison” is the icy pink, fussy in the garden, but worth it…with the modern Eden, also called Pierre de Ronsard. 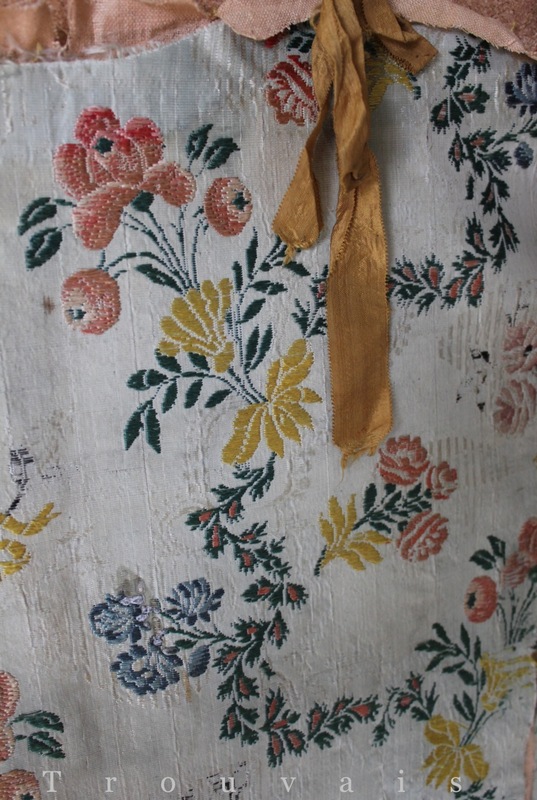 Beautiful 19th century Chateau pieces…hand block printed, or hand painted… that can be employed as bed coverings, curtain swags, wall hangings…theatrical backdrops to the drama in your lives! 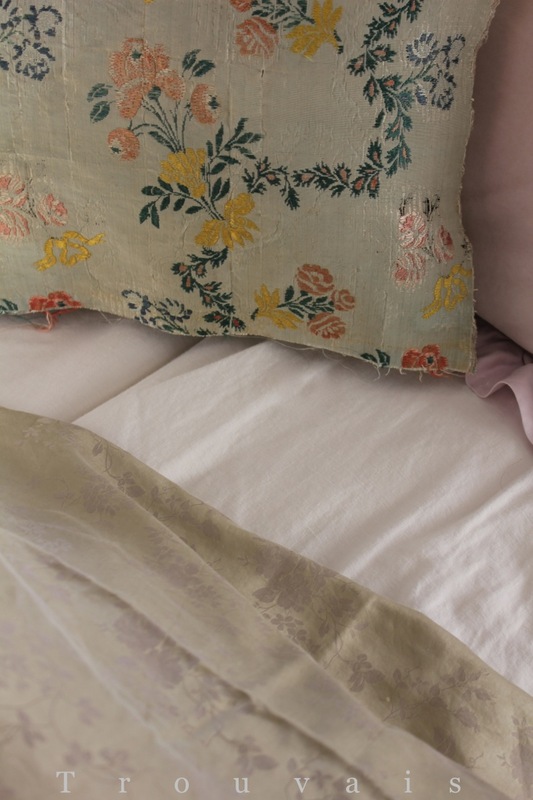 And I do love seeing the antique textiles in situ in Wendy’s home!